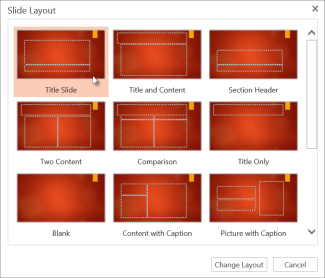 Every theme in PowerPoint includes a set of slide layouts—predefined arrangements for your slide content. "Placeholder" boxes give you places to plug your content into with little or no manual formatting and arranging. You choose a layout from a menu in PowerPoint, then insert your words and graphics. The predefined layouts include a Title slide to begin with, a general Title and Content layout, a side-by-side Comparison layout, and a Picture-with-Caption layout. For more information about slide layouts, see What is a slide layout? Select the slide that you want to change the layout for. Select the layout that you want. The layouts contain placeholders for text, videos, pictures, charts, shapes, clip art, a background, and more. The layouts also contain the formatting for those objects, like theme colors, fonts, and effects,. Note: Select Home > Reset if you made layout changes you don't like, and want to revert to the original layout. Using Reset doesn't delete any content you've added. For PowerPoint 2013 or newer, see Change the orientation. For PowerPoint 2010 or 2007, see Change the orientation. Add placeholders to contain text, pictures, videos, etc. In Normal view, on the Home tab, click Layout. Pick a layout that best suits the content of your slide. The slide layouts appear as thumbnails in the left pane below the slide master. Click the layout you want and customize it. You can add, remove, or resize placeholders, and you can use the Home tab to make changes to fonts, colors, and other design elements. Click Insert Layout to add a new slide and format it. Click Close Master to stop editing layouts. Your revised slide layout will be available to insert as a new slide anywhere in your presentation. Click Design and point to any theme. Click the down arrow under that appears under the themes panel. Click Save Current Theme, give the theme a name, and click Save. Your new theme will contain your newly revised slide layout and will be available in Themes gallery. To switch between portrait and landscape orientations, see Change the orientation. In the navigation pane, click the slide master. The slide master is the top slide in the navigation pane. Click the Slide Master tab, and then under Slide Master, click New Layout. 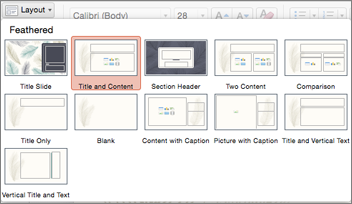 PowerPoint inserts a new slide layout with placeholders for a title and footers. Make any additional modifications to the new slide layout. Note: For more information about how to further modify the slide layout, see Add or remove placeholders from a slide layout. Tip: Modifications to the slide master and the corresponding slide layouts are temporarily added to the theme that is applied to your presentation. If you apply a different theme, then the slide master changes are discarded. If you want to keep the changes for future use, on the Themes tab, under Themes, click Save Theme. You can use custom layouts to create a series of layouts that have the same look but have different content. For example, you can create the first layout with your company logo in the left corner and a text placeholder, and then duplicate that custom layout and change the placeholder to a table. In the navigation pane, click the slide layout that you want to change. Slide layouts are below the slide master, which is the top slide in the navigation pane. On the Insert menu, click Duplicate Layout. When you complete the changes in slide master view, click Close Master on the message bar to return to normal view. Tip: Modifications to the slide master and corresponding slide layouts are temporarily added to the theme you apply to your presentation. If you apply a different theme, then the slide master changes are discarded. If you want to keep the changes for future use, on the Themes tab, under Themes, click Save Theme. You can delete any slide layouts from a slide master except the ones that are in use for the current presentation. In the navigation pane, click the slide layout you want to delete. Slide layouts are below the slide master which is the top slide in the navigation pane. Click the Slide Master tab, and then under Slide Master, click Delete. 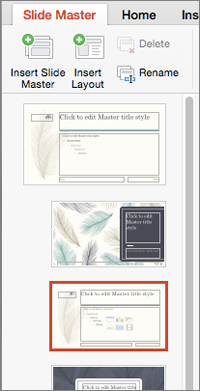 You can change the name of a slide layout, which will change the name that is shown for that layout in the New Slide or Layout menu on the Home tab. Click the Slide Master tab, and then under Slide Master, click Rename. In the Layout Name box, type the new name. Each slide layout contains placeholders for text, pictures, charts, shapes, and more. When you are arranging content on your slides, picking a slide layout that best suits your content gives you a head start. Pick a layout for your new slide and then click Add Slide. Pick a layout that better matches the content on your slide, and then click Change layout. Tap the slide whose layout you want to define. Tap to select the slide layout you want. The layout is applied. You can continue editing the slide or move on to another one.